Exercising can be a particularly difficult task to do for plus-sized people. But these yoga poses for plus size women are exactly what you need if you’re plus-sized and are looking for an easy, simple workout to do from the comfort of your own home! You’re probably here because you’ve had enough of those aches all over your body and the way the lack of mobility leaves you feeling awful at the end of every single day. Yoga is a great solution to this as it stretches all of your muscles, improves your flexibility and gives you some physical exertion which is crucial if you lead a sedentary lifestyle which, let’s face it, most of us do these days. When you think about yoga, let me guess: you imagine those thin, beautiful women in yoga tutorials and advertisements and assume yoga is only for “fit” women with the”perfect body”. Well, this couldn’t be farther from the truth! The true beauty of yoga is the fact that literally, ANYONE can find a routine suitable for them, according to their height, age, weight, body type, flexibility, etc. This is because of the HUGE diversity of yoga poses! Sure, the most well-known and popular poses may be the ones where you need to bend into a pretzel or use tons of muscle to achieve. But these are just top-level poses. There are hundreds of simple, easy, beginner yoga poses for plus size people. So if you’re plus-sized and have been telling yourself you’ll start working out but just don’t know which workout is most suitable for you, enough procrastinating! Yoga is the perfect low-intensity workout to get you moving towards a healthier, thinner you! Just try out this workout with yoga poses for plus size women to see for yourself how great yoga makes you feel! This pose is one of my favorites to start a routine out with because it stretches out your hamstrings and warms you up for other poses. Stand on your feet at about hip width. Slowly bend forward from your hips, not waist. Always keep your back as straight as possible and reach for the floor. If you can’t reach the floor with your hands, don’t worry! Just use a yoga block. With practice, you’ll stretch out your hamstrings and master this pose in no time! Stand on your feet at about shoulder-width. Extend your hands above your head and put your palms together. Then, raise your left foot and put it as high on your right inner thigh as possible. While doing this pose, always focus on keeping your back straight and tightening your core muscles. This helps maintain stability. If you find it difficult to remain balanced, just put your hands together at your chest. Hold this pose for a few deep breaths, return to starting position and repeat with the other foot. Begin on your hands and knees. Slowly bend your right foot and bring it forward, past the middle of your hands. Lean your right heel on your inner left thigh. Then, extend your left leg backward and lean on your toes or just the top of your foot. Your hips should always be facing forward. If you’re a beginner, you should place something under your right hip, such as a blanket or a pillow, if it isn’t touching the floor. Lean forward as much as you comfortably can. Hold this pose for a few breaths, then repeat with the other foot. Sit on the floor with your legs in front of you. Bend your right leg and lean your right foot on your inner left thigh. If you feel uncomfortable, put a blanket under your right knee. Keep your spine as straight as possible and lean forward. Reach your left foot with your right hand or with a yoga strap. Hold this pose for a few breaths and repeat with your other foot. This pose is great for eliminating back pain and stretching out your chest and back. Begin on your knees with your legs about hip-width apart. Slightly bend backward and grab your right ankle with your right hand. Then, arch your back and push your chest forward a bit and reach your left ankle with your left hand. Arch your back as much as you comfortably can because the more you arch it, the more your chest is stretched. Hold this pose for a few breaths, return to starting position and repeat a few more times. See, yoga doesn’t have to be super complicated, there are a lot of easy routines, too! These were just some of the best yoga poses for plus size women in my opinion. If you enjoyed this routine, I definitely suggest learning much more yoga poses and techniques! I recommend Zoey Bray-Cotton’s “Yoga Burn” program, especially to learn some yoga poses for plus size women as this program is aimed specifically at women who are trying to lose weight! The program is composed of 3 phases with different videos explaining everything in detail. So it’s very easy to follow and understand which makes it perfect for beginners. One of the best parts of this program is the fact that it is designed to help you lose weight! 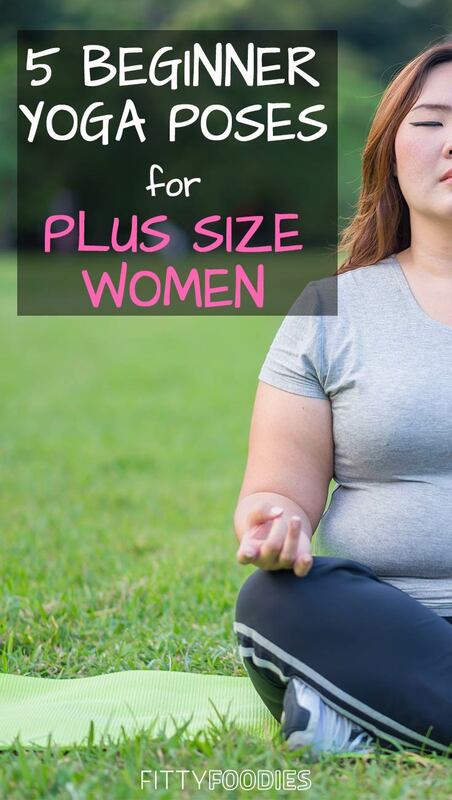 So you’ll be sure to find much more yoga poses for plus size women in this program! And by combining them with the correct diet plan, you’ll be sure to reach some amazing weight loss results! Plus, you can use this program right from the comfort of your own home! So no driving to a yoga class at a certain time several times a week. You can create your own schedule and all you’ll need to do is just pull out your yoga mat in your living room and open up your laptop or cell phone! The “Yoga Burn” program is just the perfect opportunity to both lose weight and start giving your body the exercise it needs! Definitely, consider trying it out, you definitely won’t be sorry! I can assure you’ll feel much healthier, happier, and you’ll start moving towards a thinner you!